It now looks like AMD will be releasing 6-core AMD Ryzen CPUs, despite recent rumours to the contrary. These rumours can into being after it was questioned whether or not AMD had the ability to disable separate systems within their "Zen" Quad core module without impacting the system's shared L3 cache. Now several sources have released some new information, stating that their inside sources have confirmed that 6-core Ryzen CPUs will be created, leaving no gaps between AMD's quad-core and oct-core CPU lineups. Below is a quote from IO-Tech, which states that AMD can disable separate CPU cores from their quad-core clusters, without negatively affecting shared elements like L3 cache. Some information about recent Ryzen engineering samples has also come to light, showcasing an 8-core CPU with a 3.6GHz base clock and a 4GHz boost clock as well as a 6-core model with a 3.3GHz base clock and a 3.7GHz boost clock. 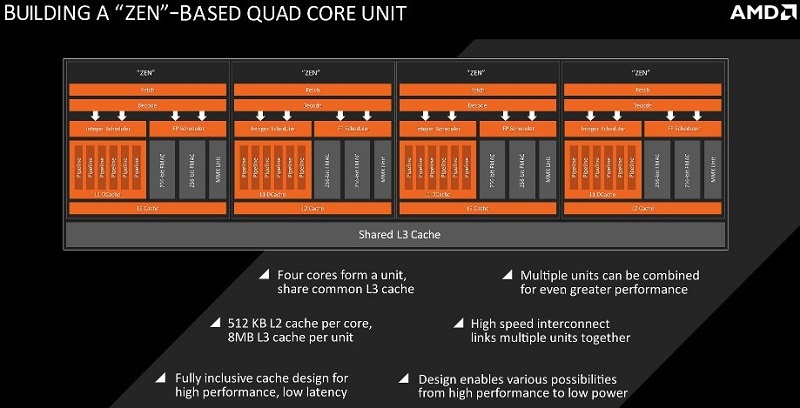 This type of core architecture makes a lot of sense for AMD, as the inability to disable separate sections of their Zen 4-core modules would severely limit AMD's ability to make a large range of SKUs, especially for the mobile market. When AMD releases their Raven Ridge series of APUs, 2-core models will be important for the basic notebook market, with 6-cores being useful for future high-end desktop platforms. You can join the discussion on AMD's Ryzen CPU lineup on the OC3D Forums.